The Kingman Concert Band is dedicated to sharing free musical performances throughout the greater Kingman area and providing performance opportunities for community musicians. 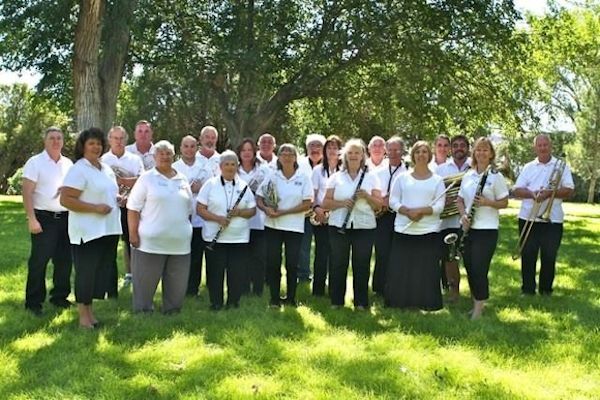 Celebrating fifteen years of community music, the Kingman Concert Band is a 501(c)3 non-profit corporation dedicated to sharing free musical performances throughout the greater Kingman area. KCB is dependent upon financial contributions for the continued growth of our band, its music library, rehearsal space and other performance factors. Please consider making a charitable donation to the Kingman Concert Band. Do you play a musical instrument? If so, join our band! This volunteer group welcomes musicians of all levels over the age of 18 years who play wind & percussion instruments to join its ranks. The Kingman Concert Band rehearses most Mondays mid-August through early May at 7:00 P.M. in the Kingman Middle School band room (1969 Detroit Avenue). In late 1998 a small group of local musicians led by Marian Craig, a librarian and flutist, met with the idea of forming a community concert band. Julie Porter-Hickok came up with the name “Kingman Concert Band.” The new band had its first rehearsal in March of 1999 with one flute, one euphonium, one clarinet and Les Krause conducting. By May 5th of that year the band performed its first concert, a ‘Cinco de Mayo’ celebration for the Downtown Merchants Association. A huge band of about nine. The Kingman Concert Band is a 501(c)3 tax-exempt Arizona non-profit corporation overseen by a eight-member Board of Directors. All performers, board members & committee members are volunteers, serving without compensation. The Band exists solely on donations from the public in order to purchase music, provide rehearsal space and maintain the organization’s website. All performances are free to the public, nor do we charge membership dues. Donations to the band are gratefully accepted. Play a musical instrument? If so, come join us! We welcome musicians of all ability levels age 18 years of age or over who play wind and percussion. The band welcomes new members, providing a forum for adults over 18 years of age who wish to play good music, engage the community and have fun. The only requirements are an ability to read music and play an instrument. We accept members of all skill levels in woodwinds, brass and percussion. Musicians are required to provide their own instruments, with the exception of percussionists. Rehearsals are held at Kingman Middle School on Detroit Avenue. We urge all local musicians, professional or amateur who possess adequate playing skills, to get their instruments out of the closet, dust them off and come join us for music, fun & friendship. We promise you’ll have a great time! For more information, phone our Conductor Julie Gragg at (928)853-3846 or complete the New Member Form.